It's a pretty bold move for a major release to have neither style nor substance, but not even the enchanting presence of Gina Rodriguez can keep this unnecessary remake from its own stupidity. Giving us only one scene of character development – handled in a cliché scene where her boss literally tells her "I'm not paying you to think" – before whisking her away to Tijuana, Miss Bala gets straight to its poorly executed action. When gunmen shoot up the club where Gloria and her friend Suzu (Cristina Rodlo) are schmoozing with beauty pageant sponsors, they're separated. An absolutely preposterous set of circumstances force Gloria to work for both the cartel and the DEA. Both groups blackmail her and promise to help her find Suzu, but nearly every scene relies on Gloria being the most gullible person alive. It's also absurd that she's constantly amazed at how violent the drug cartel is. When a hitman's girlfriend is ID'd as a mole, she is somehow stunned that they would kill her. The film really has nothing to say about the failed drug war that hasn't been said before. The cartels are bad but American and Mexican law enforcement might be worse! Imagine! There's also a serious lack of stakes in this PG-13 movie. Dozens upon dozens of people are shot and killed but there's nary a drop of blood. About the only positive moments are the occasional darkly funny punchline. After Gloria inadvertently helps the cartel blow up a DEA safe house, three goons take a selfie up the hill above the rubble. And when she witnesses a murder, she vomits over a balcony and some of it gets stuck in her hair. But why the film wants to set up a will they/won't they relationship with Gloria and Lino, the head of the cartel (Ismael Cruz Cordova), is beyond me. Still, it does lead to the film's best scene: a date where Lino takes her to a roadside restaurant for some authentic barbacoa. The film finally pauses for some shading of the characters. But it's too little, too late. 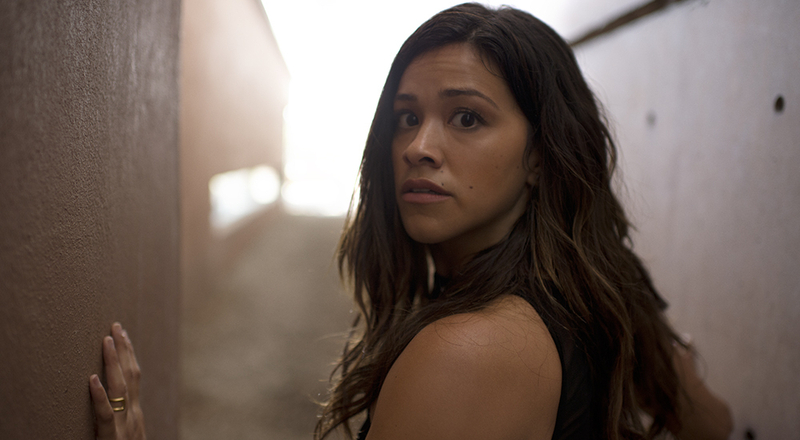 Miss Bala is a series of wrong choices, starting with remaking it in the first place. Gina Rodriguez is a star. She deserves a better showcase.